Absolutely stunning private villas! 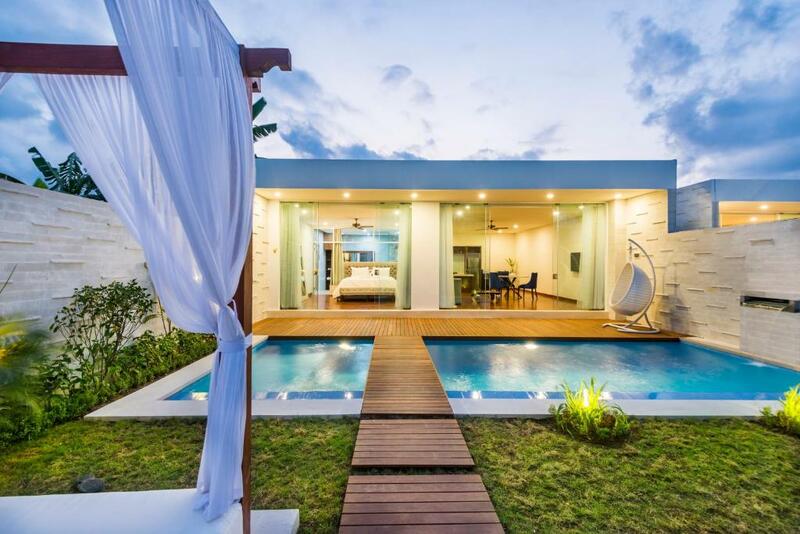 The villas are breathtaking, beautifully designed and clean with a private pool. We stayed for one night for our anniversary and were surprised with balloons and rose petals on the bed and in the bath. We got the romantic dinner brought into our villa and oh my god - it was the most beautiful thing I've ever seen. They decorated our pool and table with rose petals and candles, absolutely stunning! Would recommend for couples. the villa is so big with a excellent pool. The staffs here are very nice people and always has a smile on their face. Its location is very convenience. The Property and Room was amazing. Arung the manager was fantastic and so helpful always. Agung and his team was really friendly and attentive to our needs. Breakfast that was served daily is nice and fulling. Hopefully we will soon. Thanks Agung! We highly recommend this villa. Exactly what it looked like in the photos. Immaculately clean, modern, private and a cozy atmosphere. The perfect pool really cooled us down after some time on the beach. Breakfast was delicious! It was enough to start our day in a good mood. All the staff were super kind and great. Especially the manager Agung with his immediate response for everything made the stay very comfortable. He was so kind, and professional. Also, he helped us to solve our problem with the taxi driver, so we were able to get to the airport on time and wouldn’t miss the flight. A massive thank you to the manager Agung. We would definitely stay here again when we come back to Bali. The villa was new and very modern and looked exactly as the pictures show. The pool was great and we enjoyed spending time in the villa. Rooms were spacious and the aircon was good. Breakfast was very good and served in the villa each morning, we even got breakfast to go one morning when we left early. Staff very friendly and helpful. The villas were well appointed with a continuous supply of fresh drinking water, plush bedding and a good number of towels. The pool by far was the best feature of the villa, and was kept very clean. The staff were all friendly and very accommodating with any request made by us during our stay. Best customer service I have ever received. The manager Mr Agung was always there for any information I need. They even provided a mobile phone to keep it with us during the time we were out and about. The villas are spotless. Can't fault one thing. All the staffs are very polite and welcoming too. Lock in a great price for The Daha, A luxury Resort and Spa - rated 9.1 by recent guests. One of our top picks in Seminyak.Located in Seminyak, 1.2 miles from The Seminyak Square Shopping Mall, The Daha, A luxury Resort and Spa features accommodation with free WiFi, a garden, and access to a fitness room. The accommodation is air conditioned and has a hot tub. All units are fitted with a well-appointed kitchen, a living room, a flat-screen TV, DVD player, a private bathroom with bath. Some units feature a terrace and/or a balcony with pool or garden views. Ku De Ta is 1.4 miles from the villa, while Petitenget Temple is 1.6 miles from the property. The nearest airport is Ngurah Rai International Airport, 6.8 miles from The Daha, A luxury Resort and Spa. The Daha, A luxury Resort and Spa has been welcoming Booking.com guests since 5 Apr 2018. When would you like to stay at The Daha, A luxury Resort and Spa? This double room has a balcony, iPod dock and dining area. This villa features a balcony, flat-screen TV and electric kettle. The Daha, A luxury Resort & Spa , is a brand new luxury 5 star private villa complex . The property features one bedroom villas built to the highest quality and standard. Each villa is over 200 square meters with an oversized swimming pool and outdoor gardens. The Daha , A Luxury Resort & Spa is the number one luxury private villa complex in Seminyak . Daha Luxury Villas is Bali's highest ranking management company . Seminyak is the trendy, fashionable and luxury area of Bali. House rules The Daha, A luxury Resort and Spa takes special requests - add in the next step! The Daha, A luxury Resort and Spa accepts these cards and reserves the right to temporarily hold an amount prior to arrival. Please inform The Daha, A luxury Resort and Spa in advance of your expected arrival time. You can use the Special Requests box when booking, or contact the property directly with the contact details provided in your confirmation. The bed wasn't the most comfortable and the food was just ok. But this was a small sacrifice for how beautiful everything else was. We loved everything about our stay at Daha. Agung was extremely helpful and patient in recommending and making transportation arrangments for us. The villa was spaceous for two, bed was comfortable and loved the concept of the bathroom. After reading a few reviews on trip adviser about the breakfast available, I was prepared to head out of a morning. However the breakfast was excellent with multiple choices and also offered a vegetarian option. The loction is perfect and away from any noise from the hustle and bustle of seyminayk. The Vila Offers private transfer two and from the airport, however I suspect that you could get this cheaper if you shopped around. I wouldn’t change the private car service even knowing what I know now, the driver Kadek is amazing and I also used his car service to take a tour around bali. The driver know so many amazing places to visit and also know all the places I wanted to see in Ubud etc. The price was more the reasonable for 10hrs service in fact it was a bargain an I’m from London. Could not fault this place and looking forward to visiting again really soon. To the owner your manager Agung is an asset to this establishment including all the Vila workers. Thank you so much for developing a rare diamond. The quality of breakfast was OK compared to the resorts that we stayed at in Nusa Lombongan and Ubud. The people who provided breakfast were kind and friendly. We noticed a hole in our bed sheet and in the curtains of our day bed by the pool. It would have been nice to have a drying rack for bathing suits and towels by the pool. We liked the Host who was very accommodating to our stay and provided a cell phone - quickly responding to our requests. We also enjoyed the private pool in our villa. Location was about 20 min walk to main restaurants and bars and there was not much around outside on the street of the hotel. The bed frame was very flimsy and bowed under our weight in the middle which made for a very uncomfortable few nights sleep, they should have this fixed. Some sun lounges could also be added on the deck as the day bed is in a very sunny location all day. Minor thing but the forks were a little bit dirty from previous uses. Just a wash between the metal prongs and you're good to go! The bed would slightly sink when my partner and I were on it. Could be just that one room. P.S. Agung I only write these here as suggestions for improvement and to make The Daha the best it can be! The overall facilities of the villa were nice and well appointed - however, the bathroom was not up to scratch, the shower head - even though this villa was only opened in January - was not properly fixed to the roof so the water was leaking around the sides and not coming through the appropriate holes. To the management's credit though once made aware of this problem they sent someone around to rectify the issue. The complimentary breakfast was also a bit of a disappointment. The staff served cold breakfasts on multiple occasions which led to us having to source a breakfast from somewhere else. One other issue that we had was a lack of water in the villa one afternoon after our main water tap was switched off by some unknown person and the management could not explain how this happened. We were left to not being able to shower or use the toilet before going out for dinner.